ASBO International is a global community of school business professionals throughout the world. Illinois ASBO is proud to be one of the largest ASBO International affiliates! There are many opportunities to participate through ASBO International membership as well as attending Illinois ASBO events at the ASBO Annual Meeting & Expo each year. Questions regarding the ASBO International Hospitalities below can be directed to Julie Warner at (815) 753-9366. "Come sail away" with Illinois ASBO on a 60-foot anchored sailboat, surrounded by stingrays and native Florida game fish like tarpon, snook and redfish. 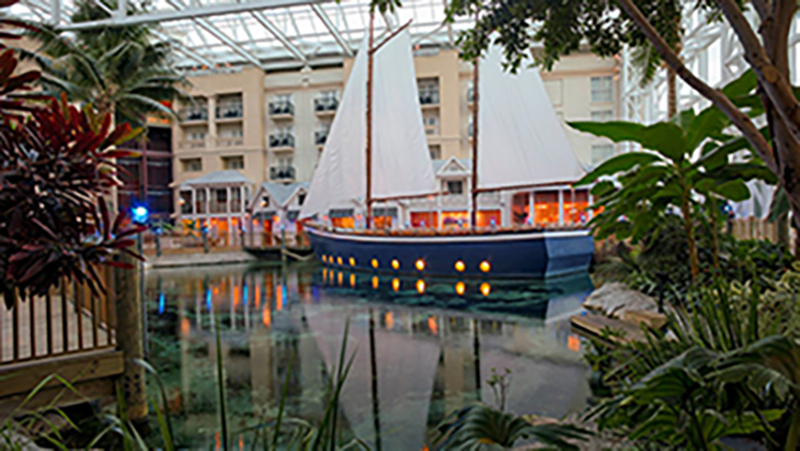 Begin your networking experience along with your spouse/guest on Thursday evening inside the Gaylord Palms Resort on the anchored sailboat located in the Key West atrium. Food and beverage service will be provided throughout the event. 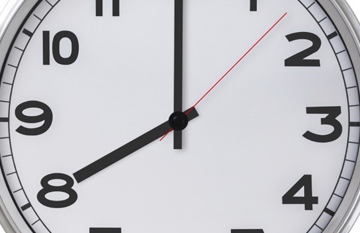 Illinois ASBO will be happy to process professional development hours for your session attendance at the ASBO International AM&E! This year, there will not be a check-in desk for Illinois ASBO members as in years prior; we will be utilizing the self-scanning capabilities offered by ASBO International to facilitate this process. 1. Scan in AND out for each breakout session you attend — Each breakout room will be equipped with scanners. 2. Fill out your survey following the conference —This will be sent to you approximately three weeks after the conference ends. This survey is required by ISBE for Illinois ASBO to award credit. Note: These are the same blue polos with the Harkin candidate logo that were worn last year. If you no longer have it, you can order another below. 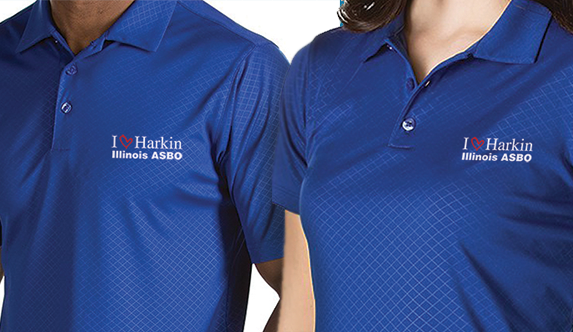 Show your support for Susan Harkin, 2018 ASBO International Director Candidate, by ordering a polo shirt with her candidate logo at no charge to you--Illinois ASBO will cover the expense. 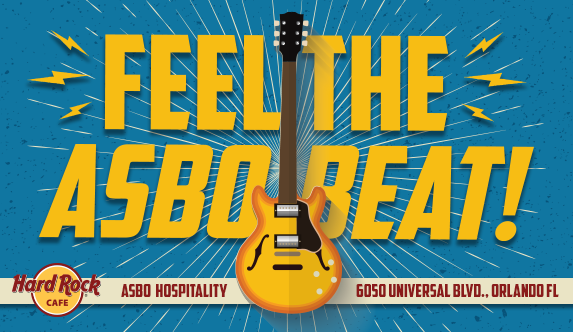 Plan to wear the polo on Saturday morning to the Opening General Session (we will all sit together as a group) and to the "Feel the ASBO Beat!" Joint Affiliate Hospitality at Hard Rock Cafe on Saturday night. If you are interested in ordering a shirt, contact Julie Warner at jwarner@iasbo.org or (815) 753-9366 for available sizes—quantities are limited! Buses will be provided. Look for the signs in the bus loading area of the Gaylord Palms. Plan to attend this event hosted by Illinois ASBO and nine other affiliates, meet the current and future ASBO candidates and dance the night away with music from the John Stone Band. Light appetizers will be provided. Show your support for Susan Harkin, 2018 ASBO International Director Candidate, by wearing the polo shirt with her candidate logo to this event! You can pay for your Illinois ASBO membership and your ASBO International membership at the same time? When you join or renew your membership, simply choose to add ASBO International membership to your purchase and we'll take care of the rest!